The 15 Best Holiday Shopping Destinations in Florida! While warmer temps in Florida may take away from the Norman Rockwell picture of a traditional Christmas, the Sunshine State provides plenty of holiday cheer. Visitors are impressed with the feel for the season, especially with the decked-out holiday shopping destinations. Here are 15 must-visit destinations for amazing shopping options and displays. America’s oldest city pulls out all the stops to provide a cheerful and bright holiday season. Shops range from one end of the spectrum to the other with unique shops such as the Golden Gypsy, antique stores, one-of-a-kind handmade jewelry stores and specialty stores. The cobblestones streets, the Christmas décor and the lit-up landmarks all work together to provide a unique and unforgettable holiday shopping experience. With over 140 boutiques, museums and cafés, it is clear why Park Avenue is Central Florida’s holiday shopping gem. The premier shopping street is accompanied with holiday events such as “Winter in the Park,” an ice skating rink in Central Park West Meadow, and with Christmas music, giveaways, movies and more! The Florida Mall offers exclusive stores such as American Girl, M&M’s World store, Carlo’s Bakery and the Crayola Experience. The largest shopping center in Central Florida, this mall boasts over 250 retail, dining and entertainment choices. Take a break from searching for that perfect gift and get the kids’ photo taken with Santa. Stroll through a winter-less wonderland at this favorite Florida destination. Mild temperatures aside, the Christmas Town Village will absolutely set the Christmas spirit. View a wide variety of unique gifts inside the holiday cabins. View and explore artisan creations, while crossing off names from that Christmas list. Seasonal treats are available, to help complete the holiday feel, such as warm cookies, hot chocolate and the village’s specialty elf munch. Cocowalk is an upscale shopping center, providing a low-key relaxing outdoor environment for holiday shopping. With plenty of dining options, brand new stores such as Victoria’s Secret, there is sure to be something for everyone on your list! When the shopping is over, relax at Cocowalk’s movie theatre. Cocowalk is an upscale shopping center, providing a low-key relaxing outdoor environment for holiday shopping. With plenty of dining options, brand new stores such as Victoria’s Secret, there is sure to be something for everyone on your list! When the shopping is over, relax at Cocowalk’s movie theatre. Another Orlando favorite is the Universal CityWalk. This location provides the perfect blend of holiday shopping and festive atmosphere. There is a charge for parking, but valet is also an option. CityWalk combines unique boutiques and shops with the hottest trends, Orlando-themed souvenirs, swim wear and one-of-a-kind gifts that will be sure to complete that holiday shopping list. Another Orlando favorite is the Universal CityWalk. This location provides the perfect blend of holiday shopping and festive atmosphere. There is a charge for parking, but valet is also an option. CityWalk combines unique boutiques and shops with the hottest trends, Orlando-themed souvenirs, swim wear and one-of-a-kind gifts that will be sure to complete that holiday shopping list. A tiny island town, Amelia Island is big on Christmas spirit. The Christmas on the River store is where Christmas spirit can be found, and purchased. Home décor, gifts and unique and bright ornaments are available, allowing the spirit to be taken home. When in town, be sure to check out the other specialty stores around Amelia Island. 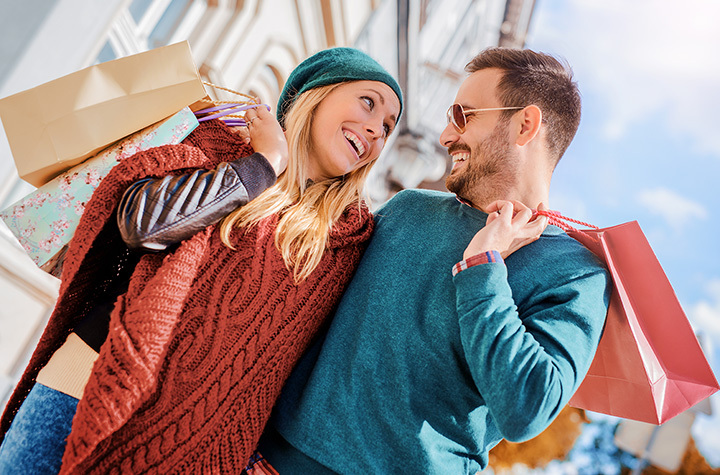 With stores like Blingin’ Buddha, Hop Dogs and The Walking Company, there is sure to be plenty of hard-to-find gifts displayed easily within reach at The Shops at Wiregrass. Holiday gift wrapping is available, and kids and adults alike can participate in the synthetic ice skating rink. Of course, no trip to a shopping venue is complete without the kids’ photo with Santa!With stores like Blingin’ Buddha, Hop Dogs and The Walking Company, there is sure to be plenty of hard-to-find gifts displayed easily within reach at The Shops at Wiregrass. Holiday gift wrapping is available, and kids and adults alike can participate in the synthetic ice skating rink. Of course, no trip to a shopping venue is complete without the kids’ photo with Santa! Dubbed the “Largest Christmas Store” in Florida, Marge’s is the year-round Christmas decoration destination. Those searching for home furnishings and décor should look no further than this one-stop shop. Marge’s offers a variety of furniture, custom bedding, odds & ends and occasional items, artwork, lighting and mirrors. A wide-range of Christmas trees, ranging in color and size and all kinds of tree decorations can also be found here at Marge’s. For the past 40 years, Robert’s Christmas Wonderland has been a family tradition. This year, let the family owners provide new décor and items that will be your family’s new tradition. With expected Christmas items, such as garlands, stockings, tree skirts and nativity sets, to unique tree toppers and thousands of ornaments, to personalized gifts such as jewelry and candles, Robert’s has something for even that hard-to-buy-for name on your gift list. With a store in both Ft. Lauderdale and Miami, convenience and uniqueness can be found at The Christmas Palace. Pillows & rugs, items for holiday entertaining, nativity scenes and commercial décor can be found in stores. Holiday floral arrangements, train sets and Santa suits round out the nice variety of items available for purchase. With a store in both Ft. Lauderdale and Miami, convenience and uniqueness can be found at The Christmas Palace. Pillows & rugs, items for holiday entertaining, nativity scenes and commercial décor can be found in stores. Holiday floral arrangements, train sets and Santa suits round out the nice variety of items available for purchase. Downtown Miami is home to this village, which houses a variety of shops, restaurants and more. Fashion shops, jewelry stores, and spas are onsite, along with a few fantastic restaurants. Move this all-inclusive, one-stop shopping location to the top of your list. This the second largest mall in South, based on square footage, and houses virtually every name brand store in existence today. In addition to amazing shopping options, visitors can learn how to wrap the perfect gift during lessons at The Container Store. There is a lot going on at the Shops at Sunset Place. Make a one-of-a-kind pottery gift and paint it at Color Me Mine. Grab some lunch, and a spare or two at Splitsville Town Center. Relax after shopping with a game or two of pool with their billiards table. Live music greets Saturday night shoppers, and there are plenty of restaurants within the plaza. With shops ranging from The Disney Store to Armani Exchange, there is something available for all your wants and needs this Christmas season. The first annual Jolly Jubilee combines holiday cheer with shopping at the Destin Commons outdoor shopping center. Combine the adventure of browsing several name brand stores with the calming and cheerful sights and sounds of Christmas. A brand new, fully lit and decorated 38-foot Christmas tree stands proud in front of restaurant row, while 12 large reindeer topiary shrubs that measure up to 14-feet watch over the live holiday entertainment. Various theatre and music groups will be out and about throughout most of December. While there are plenty of shopping options throughout the Sunshine State, these 15 stand out as more unique and full of holiday cheer.